To test the presence of a shoulder full-thickness rotator cuff tear using the Drop-Arm Sign, Painful Arc Sign, and the Infraspinatus Muscle Test. The study concluded that if all 3 tests were positive, the probability of the patient having a full-thickness rotator cuff tear is 91%. 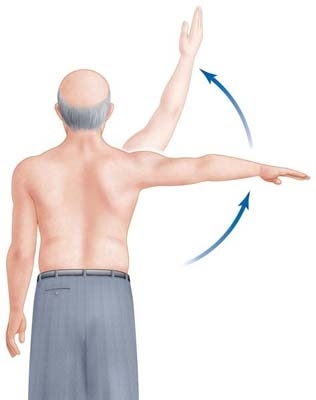 Patient actively elevates the arm in the scapular plane and then slowly reverses the motion. A positive test is defined as the patient experiencing pain during the activity or that the arm suddenly drops. Patient fully elevates the arm along the scapular plane and then slowly reverses the motion. If patient experiences pain between 60° and 120° of range of motion, the test is considered positive. Arm is resting in neutral, the patient is instructed to flex elbow to 90° and resist against applied resistance mediall. If the patient is unable to resist the force or experiences pain, the test is considered positive. ↑ 1.0 1.1 1.2 Park HB, Yokota A, Gill HS, El RG, McFarland EG. Diagnostic accuracy of clinical tests for the different degrees of subacromial impingement syndrome. J Bone Joint Surg AmfckLR2005 July;87(7):1446-55.